Warum auch? Hat sich doch bewährt das Design. Ist wie überall, egal ob Musik, Film oder von mir auch aus Essen. Wenn bald frittierte Delphin Rosetten der neue Hit sind, dauert es keine drei Wochen und Du bekommst die Dinger bei Aldi und Co.
Aktuell mein most wanted dieses Jahr. Ich sitz Anfang März aber mal sowas von im Kino! My Brother from another Mother! Bei dieser Art von Filmen ticken wir beide schon immer noch gleich! Jupp, fand ich auch mega! Genau so ging es mir gerade auch, als ich den Trailer zum ersten mal sah. Also die Motive die für den Film rausghauen werden, finde ich ausnahmslos FETT! Aber von mir ja nicht anders zu erwarten bei dem Film! Keine Ahnung, ob es zum Film passt oder nicht, ich hätte ja gedacht, der geht vom Ton her eher Richtung Godzilla, weil das ja nun im selben Universum spielt, ABER: Dieser Trailer ist phenomenal geschnitten. Fand den Schnitt mit dem Ton/den Geräuschen auch super! Sieht tatsächlich besser aus, als ich erst vermutet habe und ich hoffe da bleibt der alberne Kasperle Theater Humor draußen. 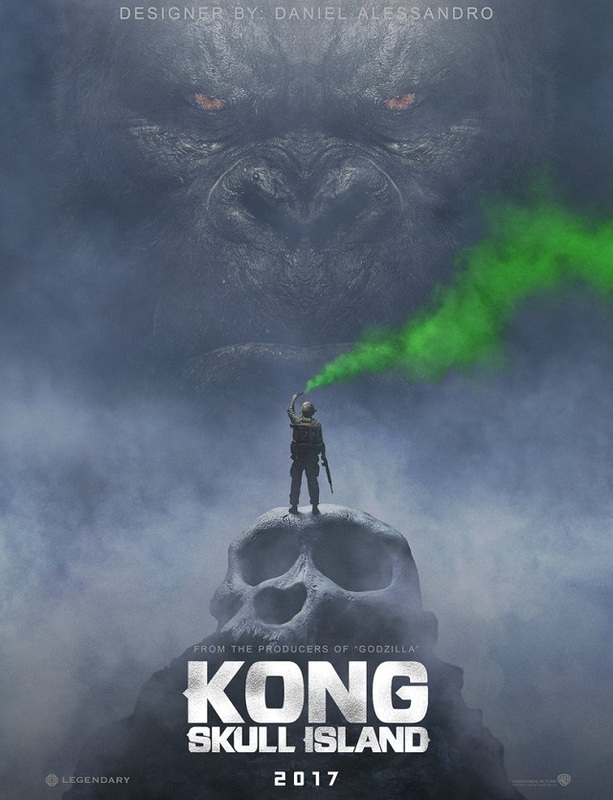 Leagues better than Peter Jackson's bloated, three-hour Kong of 2005, this one looks poised for strong returns and potential sequels co-starring hinted-at monsters from movie lore. It may have seemed like a stretch to entrust this giant project to a director whose career hitherto consisted of one small, kid-centric Sundance film, the 2013 The Kings of Summer. 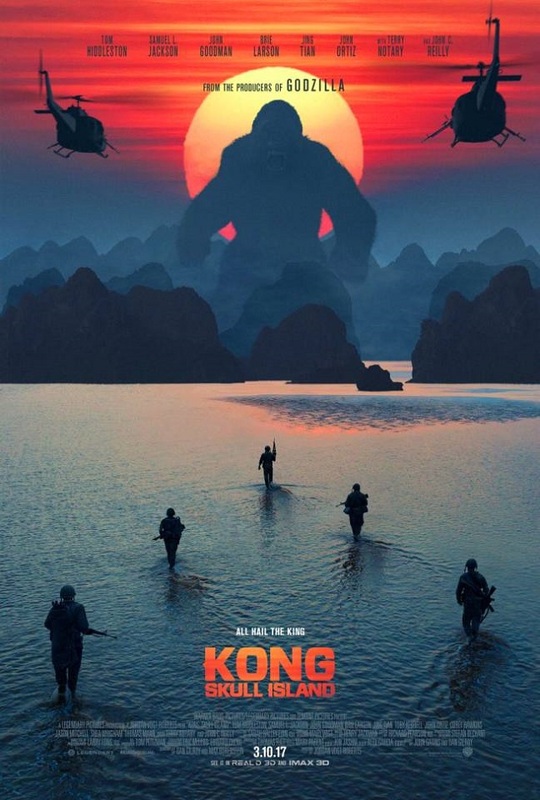 But it was Jordan Vogt-Roberts who had the crucial inspiration to set this Kong re-do in 1973, specifically at the moment the United States pulled out of Vietnam, a decision that nourishes nearly every aspect of the film. Certainly the specter of Col. Kurtz looms over the perilous journey undertaken by this tale's small band of mostly military explorers into unknown tropical territory, but what awaits them is a whole lot bigger and scarier than Marlon Brando. 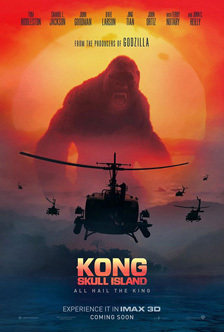 A crew is ferried by about a dozen choppers to penetrate the dense fog and rain to find what Skull Island has to offer. Among the key members are Samuel Jackson's bitter Lt. Colonel Packard, who's pissed that the U.S. didn't finish the job in Nam and brings with him his team of “Sky Devils” with quick trigger fingers; Tim Hiddleston's Capt. Conrad, a sleek SAS black ops vet now at loose ends; Brie Larson as combat photographer Mason Weaver; and Corey Hawkins as a bookish biologist, all of whom have their own agendas to pursue in a land unknown to man. Unknown, that is, except to one man, Hank Marlow (John C. Reilly), a pilot who crashed there during World War II and has lived peaceably among a few silent natives ever since. Looking like an old hippie with his tattered uniform and untended beard, Marlow has somehow survived through the years with his humor and good will intact, and Reilly's warmly funny performance becomes the heart of the film; he could have been just comic relief in an old coot Walter Brennan-style turn but, in stressing the character's generous acceptance of his strange fate, the actor makes the man embraceably multi-dimensional and accessible (one of the Chicagoan's first questions of his visitors, along with who won World War II, is whether the Cubs have won anything yet). 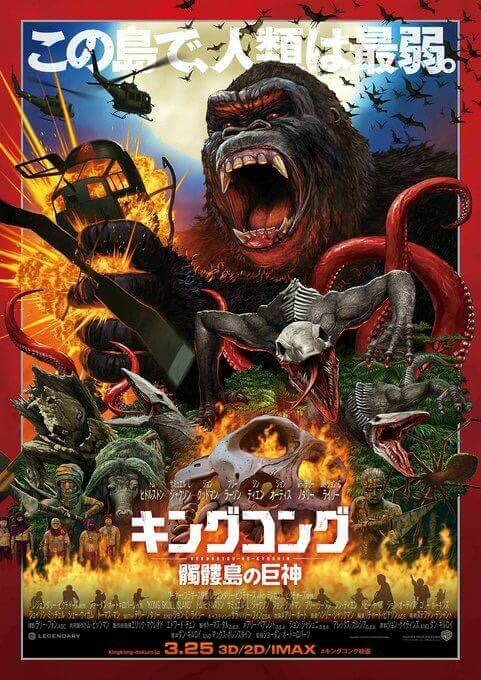 In the end, though, it's not the characters the audiences will have come to see, but the monsters, and the film doesn't stint in supplying them. 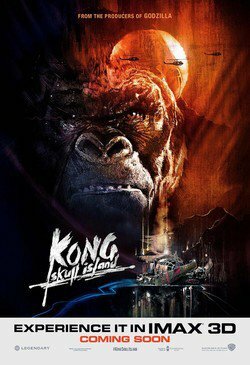 This Kong, who makes his entrance a well-timed half-hour in, is far bigger than any before him, about a hundred feet tall. Still, he faces fierce competition on the island from, among others, some toothsome lizards who happily take advantage of the change in diet offered by the new human visitors. 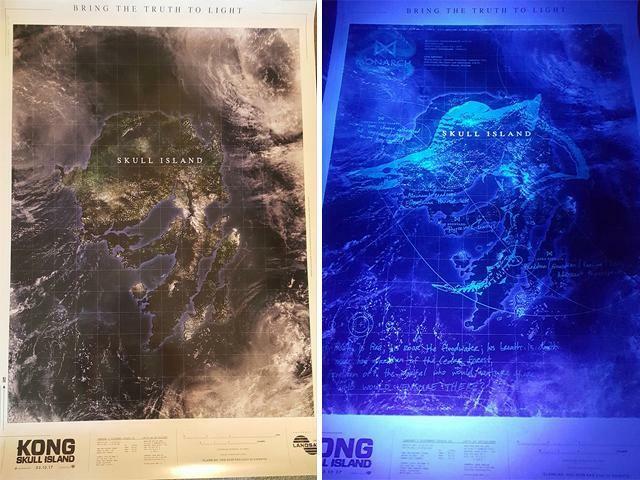 As before, Kong himself is portrayed as fearsome but also observant and sensitive. The tragic element to his character is carried over from previous incarnations; he's the last of his species, and the bones of his family are strewn about the ground. 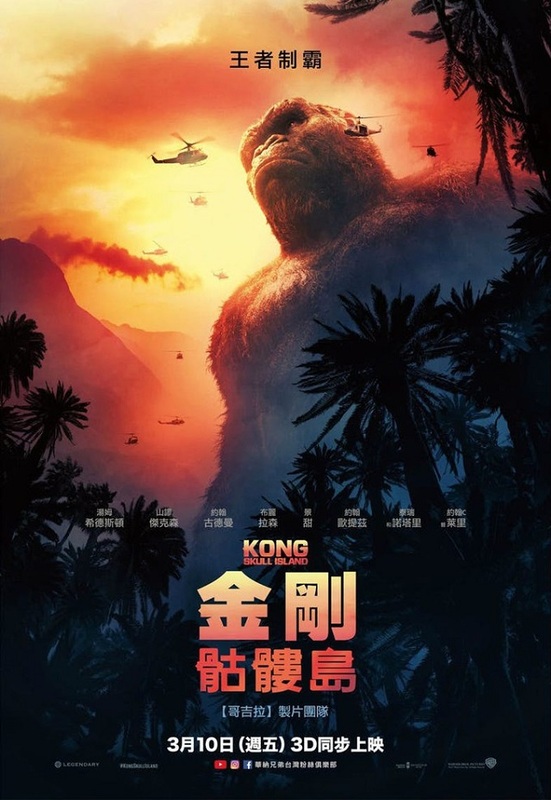 Unfortunately, he's got a new enemy in Packard, who is determined to settle his unfinished business in Nam by taking out Kong, as if that would somehow right the balance. Instead, there is considerable emotional investment to be made in Reilly's character, who is no doubt not named Marlow for nothing. Despite his decades of deprivation, he's the best-adjusted character on hand, his relaxed acceptance of his odd destiny becoming palpably moving at times, a reaction never sought or expected in this sort of film. At least as far as the humans are concerned, Reilly steals the film. Meine Frau fand den Trailer toll, also werde ich mir den wohl auch anschauen. Sieht nach solider Unterhaltung aus. Also hier kommt er ganz, ganz schlecht weg. Nach Meinung der Autorin jetzt schon der schlechteste Film 2017. Allerdings zieht sie auch ordentlich ab und schreibt sich ein wenig in Rage und interpretiert hier und da vielleicht etwas zu viel in einem Monster Film hinein.